You are here: Home / Tori's Corner / Contests and Giveaways / Purim Giveaway! In honor of the upcoming Purim holiday, I am giving away seven awesome Jewish-themed baking sets! 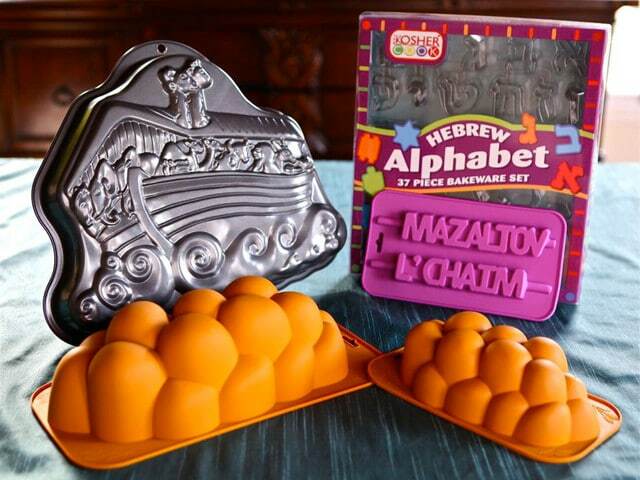 Each set includes a Noah’s Ark cake pan, Hebrew letter cookie cutters, Mazal Tov/L’Chaim ice molds, and a large and small silicone challah baking pan. To enter, leave a comment on this post and let me know what your favorite Jewish baked treat is. Contest ends on Sunday at 12:00am midnight Pacific time. Seven winners will be chosen at random on Monday, March 17. Be sure to leave a correct email address so we know how to contact you if you win. Good luck! My favorite baked good is Babka. I prefer chocolate but Cinnamon is also good. My mother-in-law’s Mandel Brot – it’s the best. However, I’m loving your recipe for the prune lekvar – matches my memory of what it should be! I like making challah but my favorite treat is hamentaschen. my favorite is challah. Enjoy your blog so much. I made tamenhauschen last year. they were cute and really fun to make! I also love challah, and try out various ways to make it good and different. I would absolutely love to have the noah’s ark set–what fun!!! I don’t know much about Jewish bajed treats bit I know you can bake brisket and who wouldn’t love that? The lemon poppy seed bundt cake looks like a winner to me. Well I would have to say that Challah is a favorite as I make it most weeks and I find your ideas for braiding fabulous! We love sufganiyot…all kinds. The kids love jam-filled, but my favorite is spicy ginger! Oooh, picking one is hard! But ok, Apple Cinnamon Walnut Cake–yum! I love baking challah and Hamantaschen and mailing them to my family. We just made up mohn hamantaschen tonight, and it was soooo good! Planning on lemon poppy seed bundt cake soon. Hamantaschan. My Husband makes it! is there anything better than homemade challah? Babka!!! Our most favorite treat! I bake it with my kids and they help roll out the dough! I immediately thought of my mother’s mandel bread. We haven’t had it in a long time, so I think my daughter and I will need to do that soon!